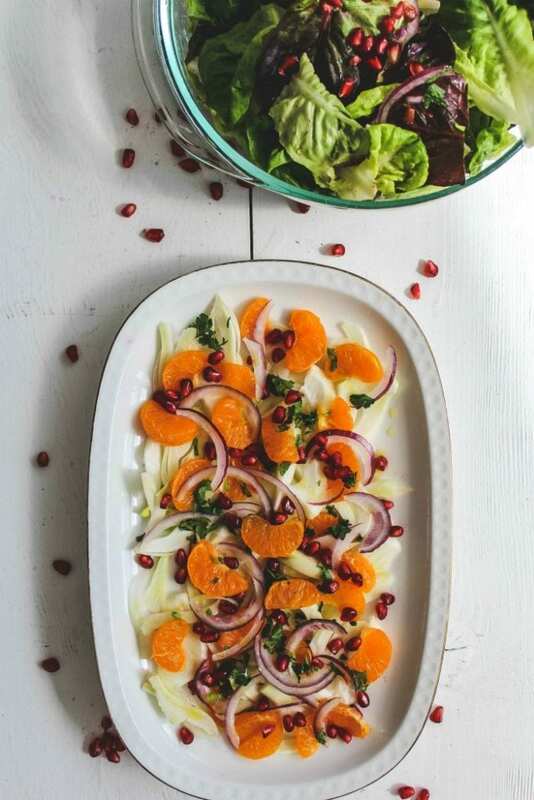 The most refreshing of winter salads, this recipe for Sicilian Fennel and Orange Salad is a delight. It’s vibrant and bursting with fresh flavors from the sweet and juicy oranges, crunchy fennel, red onions, and tart pomegranate arils. It’s a delicious flavor combination that will brighten up those end of winter days! It may be hard to believe that it is almost the middle of March and it is still the winter for many of us. 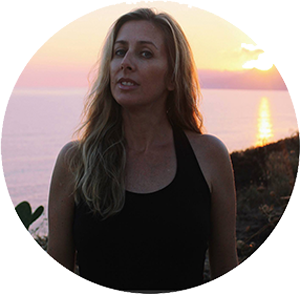 You may think that when you visit my little blog that you will only come across cakes and sweets. I have two very picky children that know and love good food so there is something savory and homemade being created here every day! 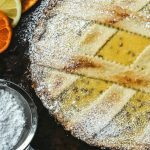 Citrus is so easy to to find in the middle of this season and it is an ingredient we love to experiment when the weather is chilly outside. Winter is the season when various citrus fruits suddenly appear. For this savory fruit salad, you could use a mixture of blood, navel, and Cara Cara oranges. You could even add a gorgeous grapefruit to give it a little tart flavor or use just one type of orange like we did. Thinly sliced fennel and red onion add a tasty bit of crunch. It is also wonderful served with a green salad. 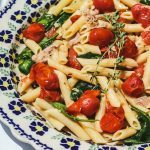 When I think of Sicilian cooking I think if its freshness and simplicity, which is so apparent in this refreshing and vibrant salad. It’s a wonderful salad to have as a side dish with any seafood dish or even a braised meat dish. Feel free to use your favorite citrus or what you find at the market. 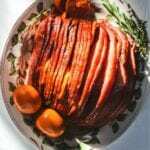 It’s stunning with just blood oranges or you could even use tangerines. The hallmarks of Sicilian cooking are simplicity and freshness, as evident in this refreshing salad. It’s the perfect side for our Sicilian seafood stew, or almost any braised meat dish. If you can’t find blood or Cara Cara oranges, you can substitute any sweet citrus fruits, such as tangerines, grapefruit or navel oranges. A simple salad with humble ingredients which is truly what Sicilian food is all about. This is a salad my father used to make and it reminds me of him. It will be my addition to my #ProjectSicilia. I will try every month to share something Sicilian with all of you. 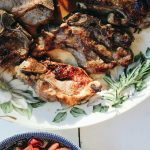 I’m sharing it for my personal record and for my kids to one day look back on and feel connected somehow through a recipe with their Nonno Rosario and their ancestors from the most splendid island in the world: Sicilia. 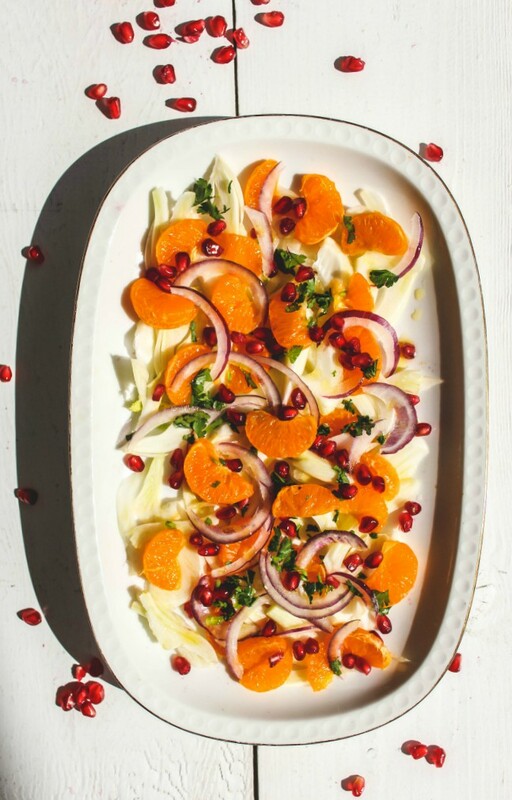 Crunchy fennel and red onion, sweet oranges and a touch of tart pomegranate makes the most delicious winter salad. With just a a handful of ingredients you could have a truly delicious and unique salad. For my vegan and vegetarian friends, this is totally VEGAN: it is dairy free. It is also gluten free. 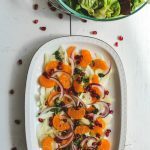 The most refreshing of winter salads, this recipe for Sicilian Fennel and Orange Salad is a delight. 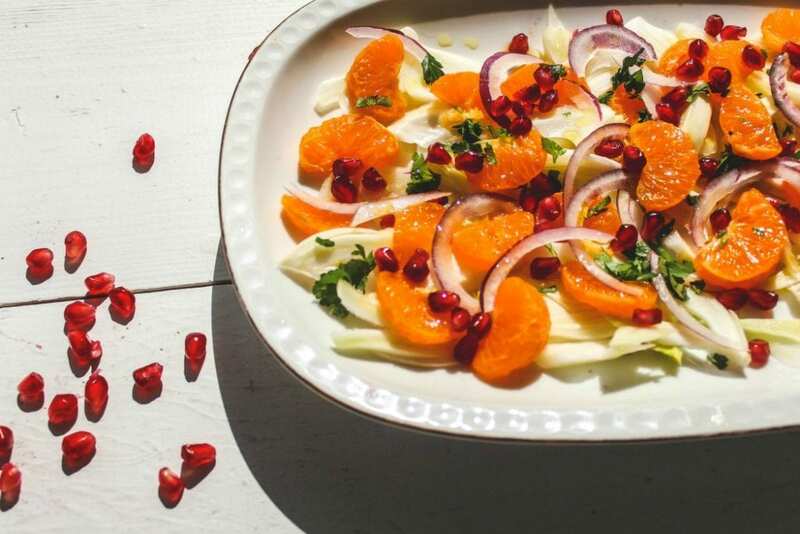 It's vibrant and bursting with fresh flavors from the sweet and juicy oranges, crunchy fennel, red onion, and tart pomegranate arils. It’s a delicious flavor combination that will brighten up those end of winter days! Arrange orange slices and fennel on a large serving platter in a random pattern. Scatter the onion and pomegranate arils on top. Whisk together the olive, vinegar, salt and pepper. Taste and adjust as needed. Spoon dressing over the salad. Add more salt if needed. Also wonderful served with a green salad. Sprinkle on some chopped fresh parsley (optional). These flavors! This salad looks incredible! I want to try it asap! Pretty salad with fab flavors, Lora!! Love the fresh flavors in this salad! Yum! You have combined amazing flavors to make this delicious salad. All the flavors in this salad are fantastic. It is perfect for summer with the refreshing flavor of oranges tied in.